Quote; "A BBC interview, of which only 20 seconds out of more than 10 minutes were broadcast, has come to light. And it has exposed the UN’s most scathing attack on the Conservative government to date. Published by the UN, it reveals the organisation thinks that austerity is “life threatening” to many disabled people in the UK. And it sees the government’s actions potentially leading to “killings and euthanasia”, because it has helped create a society where a whole group of people are viewed as “parasites”. But it’s an interview the BBC completely dumbed down for its viewers. In August, the UN Committee on the Rights of Persons with Disabilities (UNCRPD) met in Geneva, Switzerland. It was assessing if the UK government meets its obligations under the UN Convention on the Rights of Disabled People. In the BBC interview, one of the UN’s most scathing comments was about public attitudes towards disabled people. Degener said that the government and the media “have some responsibility” for society seeing disabled people as “parasites, living on social benefits… and [living on] the taxes of other people”. And she said these “very, very dangerous” attitudes could “lead to violence… and if not, to killings and euthanasia”. And she urged the government to “stop” this:" Go to: https://www.thecanary.co/uk/2017/09/15/bbc-didnt-broadcast-uns-scathing-interview-ever-uk-government-full-audio/ For full article and audio of this interview. 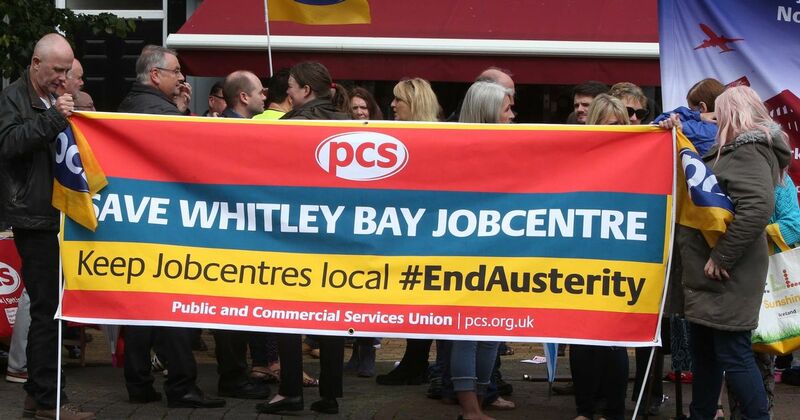 Quote; "Since the conservatives came to power in 2010, one million jobs in the public sector have been lost (see here). The champions of austerity have more than doubled national debt. It is now the sixth-highest of any advanced economy. Today, 4.2 million disabled people live in poverty in the UK. As a UN committee wrote, government policies in the UK “have caused grave and systematic violations in the rights of disabled people” (see below). The number of homeless people in the UK has doubled since 2010 (see here, here and here for a report of the Department of Communities and Local Government). When the Tories returned to power in 2010, there were some 66 food banks in the UK. Today, there are more than 2.000 and they cannot keep up. The Universal Credit Scheme (“social welfare”) that the Tories have introduced leads to an avalanche of evictions (see here; today, 4 out of 5 people who have been transferred to this new scheme face eviction because they are unable to pay rent (see here and here))*. But no problem, the Tories are cooking up a scheme which may ultimately prevent up to four million people from voting in the next general election (see here). Last Saturday, Boris Johnson repeated his scandalous Brexit lie about the £350 million a week that the UK would invest in the NHS if the country would be out of the EU (see here for an excellent article on Theresa May, her government and all the Brexit lies). For the rest, it is all about the immigrants – May’s personal pathological obsession." Go to: http://www.flassbeck-economics.com/the-tories-are-using-the-brexit-to-turn-the-uk-into-a-right-wing-dictatorship/ For full article. Quote; "Commissioned by the LGA, “The Cumulative Impact of Welfare Reform: A national picture,” shows the impact of welfare reform across the whole of the UK. It assesses the devastating impact of welfare cuts, growing inflation and ever-steeper rent rises in the private sector. The study examined over 40 local authorities, representing 9.1 million households, receiving either a Department for Work and Pensions benefit, Housing Benefit, or Tax Credits. The data was examined via a modelling tool, the Benefits and Budgeting Calculator, used to measure the impact of reforms that have taken place and those yet to come. It finds that reductions in household income will hit poorest families hardest, with more than 84 percent of lone parents or couples with children set to lose up to £50 a week or more in income. The government’s overall agenda, dressed up as welfare “reform,” is underpinned by slashing welfare spending and encouraging people to move from benefits into work. By 2015, after five years of austerity, the Conservative/Liberal Democrats coalition had slashed nearly £17 billion from the social security budget. Theresa May’s current Tory government is committed to a further £12 billion in welfare cuts by 2018. This equates to a £1,500 cut for 8 million households in the two years to 2018." Go to: http://truepublica.org.uk/united-kingdom/millions-uks-poorest-families-driven-deeper-poverty/ For full and extensive article. Quote; "A mother committed suicide after asking mental health workers “What have I got to do? Top myself to get help for my son?”. 73-year-old Valerie Grant walked in front of a train on 23rd April after a string of benefits and support were taken from her severely autistic son James, 37. In the months leading to Mrs Grant’s suicide, Mr Grant was devastated by the removal of his disability benefits. Mrs Grant had a history of depression. On the 10th January, she scored 96% for the severity of her mental health state after telling her GP she was suffering suicidal thoughts. Following this, she was given a routine appointment which she did not attend.".. Mr Haigh has previously raised concerns about the possible link between benefits and suicides, calling it a “worthwhile issue to explore”. It is just being swept under the carpet. One agency blames another agency and they can get away with it. Sadly, Mrs Grant’s decision to end her life shortly after such dismal decisions by the DWP is not an isolated incident." Go to: http://evolvepolitics.com/mother-killed-get-help-son-disability-benefits-slashed/ For full article. Quote; "A report from a UN committee has criticised the UK government for its treatment of disabled people, saying it needs to do much more to protect the rights of the disabled. The UK is required to regularly report to the UN on how it is honouring the Convention on the Rights of People with Disabilities*. Anastasia Tempest, who lives in York, has cerebral palsy and uses a wheelchair. She told 5 live’s Tony Livesey: "Social care managers are not equipped, and lack skill, in knowing how to assess people with disabilities." She said she was asked "quite ridiculous" questions in her assessment, including "who does your eyeshadow?" and "do you put your own earrings in?" A government spokesman said: “We’re disappointed that this report does not accurately reflect the evidence we gave to the UN, and fails to recognise all the progress we’ve made to empower disabled people." He said the UK spent a record £50bn a year to support disabled people and those with health conditions - the second highest amount in the G7. *Bold italics mine...How many Brits know that this is the case? Is the process open to public submissions? "Case managers like me are well-trained to deal with any claimants threatening suicide"
Quote; ""It is not uncommon for charities and support workers to inform case managers – the ones whose job it is to assess people for universal credit and other benefits – of the law, rather than the other way round. Full-time case managers on average handle in the region of 300 claims each. We recently started a new way of working whereby tasks are prioritised in a “trigger” approach, meaning we often only have time to look at the highest risk cases. Payments and “payment blockers” are the first priority but many case managers struggle to make it past these on a daily basis. Claimants are told that they must fill out an online “universal credit journal” about their job searches and keep it up to date in order to release the benefit – their “work coach” is the person who’s supposed to keep in touch with them about those notes. But in reality, claimants are putting important journal messages about jobs and interviews online all the time, and the case managers and work coaches can’t reply. Each employee has dozens of other unseen journal messages they simply don’t have enough time to address." Go to: http://www.independent.co.uk/voices/universal-credit-dwp-worker-case-manager-benefits-system-government-food-banks-a7998196.html for full article. Arafel: I know from personal experience that if the claimant wants to appeal an Employment and Support Allowance decision they may not claim Universal Credit during the process of appeal (and this is true during the initial "mandatory" reconsideration period also), such appellants may only apply for Job Seekers Allowance. What genuine appellant will subject themselves to the JSA regime? Most find the notion frightening and will avoid the strictures of JSA if at all possible. I wanted my ESA claim reconsidered but have been forced by this policy to try to claim the disability component of Universal Credit. I was without benefits of any kind for approx. four weeks following my unsuccessful ESA claim, the Govt. are now billing me for this pleasure and (like 4-5 U.C claimants), I now have a rent debt and am receiving less (following deductions), than I would be on JSA! We are a constitutional monarchy that relies on the judiciary to direct parliament concerning its legislation, who I ask you sanctioned this particular mugging of the vulnerable? It is legal nonsense. The bias inherent in the assessment process for ESA and UC claimants detailed in the story below is precisely what I experienced, in-fact my ESA appeal was to be based primarily on the breathtaking lack of inquiry made as to the state of my mental and emotional health. I had just lost an upper tribunal appeal for Personal Independence Payment that supported a decision not to award me the benefit based on a score of six points (where PIP starts at eight points), the ESA assessor some months later scored me zero points out of fifteen ("Theresa I can walk!"). Quote; "Work and Pensions Secretary Iain Duncan Smith excels at this kind of redefinition, setting up a think-tank, the "Centre for Social Justice", to lend intellectual heft to his politics. The CSJ is a remarkable exercise in finding evidence to fit conclusions, with its "Breakdown Britain" report recommending marriage as a solution to all social ills, and sending its researchers to the US to formulate the basis for Conservative "workfare" policy. Both Duncan Smith, in his endless references to drug addicts and the permanently jobless, and his pet think-tank, promote the idea of a parasitical "underclass" that need shaking out of dependency, and use that analysis to gut social provision across the board. It didn't matter that the analysis was discredited by countless social scientists and historians: it gave IDS the chance to redefine "social justice" as a matter of personal moral probity, so cuts were a painful but necessary medicine, rather than a matter of entrenched wealth gaps, inequality of opportunity or exploitative employment – matters unexamined by the "independent" CSJ." Go to: https://www.vice.com/en_uk/article/9bjg9p/conservatives-use-the-language-of-social-justice-to-pursue-socially-unjust-policies for full article. Quote; "The ‘job coach’ – a title given to a jobcentre worker – has decided that this person can and indeed must contract to look for work in order to receive "Universal Credit" (not "ESA" ed. Arafel), which is paid at the same amount as job seekers allowance (JSA) of £73.10 per week. 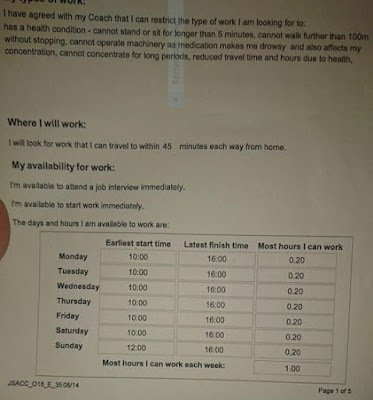 The job coach has decided this person can work 1 hour per week and for no more than 12 (twelve) minutes each day and with a 45 minute travel time to and from each 12 minute maximum spell of work each day. This scrounger is FIT FOR WORK according to the DWP! Yet this woman is FIT FOR WORK according to the DWP and can work for up to TWELVE MINUTES PER DAY. 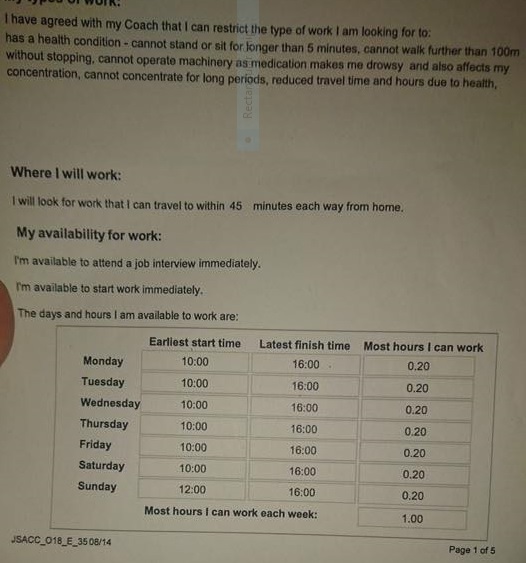 This genuine letter describes what the DWP and the Tory government mean when they say you are FIT FOR WORK. In DWP and Tory-speak FIT FOR work is the lowest common denominator and if you are fit to work for this 1 hour per week though it could easily be 1 minute per week you are deemed as fit for work. IF and at the absolute discretion of the job coach you have not done enough to search for work then they have the absolute power to sanction the person which means no benefit paid at all and for up to three years!" Go to: https://speyejoe2.wordpress.com/2017/08/25/fit-for-work-oh-do-feck-off/ for full article. Quote; "The Tories are currently claiming that they have given ‘parity of esteem’ to mental health. Yet just last week the SKWAWKBOX shared the account of someone with severe mental health issues who just weeks ago was denied support based on a series of questions, by a private company on behalf of the DWP (Dept for Work & Pensions), that concerned only physical health. The film below is four years old. It was made by Tyneside Mind – and it won the 2013 Royal Television Society Award Winner for ‘Best Factual Non Broadcast’. Yet only a little over 21,000 people have seen it. That needs to become every single person in this country. In August, the mainstream media and the Establishment – including right-wing Labour MPs – rounded on the excellent Labour MP Laura Pidcock for saying that she regards Tory MPs as ‘the enemy’ because of the harm they do to people. The vast majority of people, watching this film, will find it impossible to disagree with her. It's the "soft" British Fascist version of the NAZI slave state except our huge subterranean concentration camps contain thousands upon thousands performing only one task once a week (for a life-sapping bowl of gruel and water); ...."Use your 'ead Tommy!!" "Alright Ganger!" BANG! Aside; "Tommy hasn't got any arms but he's productive!" I call for a new approach by the human rights community, the development community and Governments that gives due attention to how often and how exactly the civil and political rights of the poor are violated*." Go to: http://www.ohchr.org/EN/NewsEvents/Pages/DisplayNews.aspx?NewsID=22237&LangID=E For full article. 1. An immediate rise in all benefit levels and the minimum wage. 2. No ESA claimant changing to the new system is to lose their entitlement to Universal Credit Disability Component payments until they have been assessed and a mandatory appeal entered into (if requested), and dismissed (this could be done by the simple expedient of treating the U.C disability component assessment as the re-application for ESA it would otherwise have been). 3. There will be no advance payments made as loans, all advance payments made to successful applicants for any component of Universal Credit should be treated as a component of the benefit. 4. No one in receipt of Housing Benefit is to have that stopped at any time. 5. Housing Benefit payments and the Housing Benefit component of U.C should be paid directly to the landlords. 6. New Universal Credit claimants should enter into an introductory period lasting not less than six months when their capabilities can be properly assessed and orientation "workshops" attended (a number of creative ideas could be tried regarding targeted "field trips" -et.al-, for certain demographics within the system etc.). Ironic though..hope you know I left half-way through a degree..